This weeks European theme meant our remaining six bakers had to make their minds up which bakes needed just a little bit more boom bang-a-bang if they wanted to get congratulations at their waterloo with the judges. (You get the point) If my opening made you cringe Mel and Sue kicked-off with a pant-twitchingly uncomfortable plethora of European clichés that felt like we’d stepped into a ninety seventies cabaret show. They set our sextuplet to work on the signature challenge; a cake inspired by those of Europe. It must include yeast but could have a filling and decor of the baker’s choice. Now we’re heading towards the finish line we’re at a juncture where each contestant gets a healthy amount of screen-time. Gone are the days of sign-post editing – the Martha is hardly featured, obviously she doesn’t get voted off kind of thing – now we really have the chance to know them, see them interact with each other and explore their bakes in depth and it’s a stronger show for it. To the bakes – Luis neglected his Spanish heritage and went for an Austrian inspired apple and cinnamon kugelhopf with honeyed apples topped and roasted almonds that quietly impressed our silver foxes. ‘Appearance most attractive and a good height’ thought Mary. ‘It’s all to do with the texture’ explained Paul ‘it’s very good.’ Richard, pencil-behind-ear still ever present, decided on a German guglhupf. A tall, ring shaped bake he opted for a fruity offering with an orange glaze. Bit like Paul really. The results weren’t quite as fruity. Mary thought ‘it didn’t look very inviting’ but thought ‘the flavours are good.’ An uneven mix led to Paul’s judgement ‘needs more of a rise. It’s too dense.’ Kate went for an Israeli pecan and chocolate sour cherry yeast cake. A brave choice you’d think. She then went on to explain she’d spent time in Israel, disliked their cakes and had adapted the recipe for herself. A move that felt a bit like Brits going to the Algarve and opening a beach-side bar called The Golden Lion. Her bake also managed to be impressive as a warm pint in the sun with Paul thinking the ‘choice of flavours wrong. The inside is quite dry: dry chocolate with dry cherries.’ Mary was more positive on the choice of flavours but it was not a good opening for Kate. In another renegade decision Nancy opted for a rum punch savarin with coconut cream and tropical fruits. Yep, tropical. As in rum. As in the Caribbean. Despite her geography being more askew than Sue’s glasses she received a warm round of praise ‘the actual savarin is a beautiful colour. Tastes good!’ exclaimed Mary. Despite claiming it was over-proved Paul praised the flavour as ‘fantastic.’ As I mentioned, less baker’s mean the quieter contestants like Chetna get more of a look-in. On reflection I’ve perhaps been over-harsh of her in past weeks. She’s a consistent baker - she’s still in the show - and her orange savarin filled with pistachios and with cinnamon cream was met with all round praise. 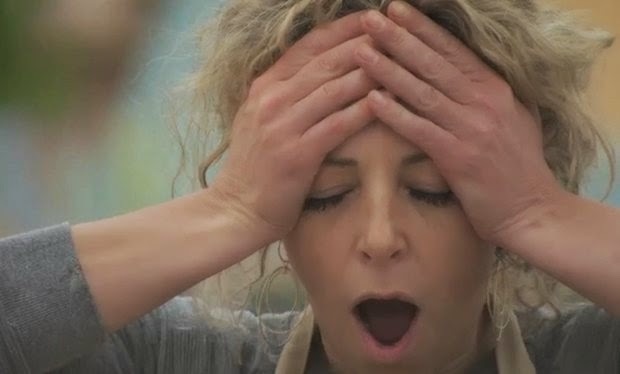 Another technical challenge and another brilliant sequence of panic and fear as the bakers realise they’ve not got a pound in Europe’s chance of knowing the recipe. With twenty six separate ingredients and fourteen stages they were tasked with a traditional Swedish princess cake. The cake is three layers of sponge, filled with crème and jam with a dome of whipped cream topped with a green marzipan. Two and a quarter hours later and we were greeted with a whole range of Shrek crossbreeds. Martha did a fair job with a cake of distinct layers and good jam, placing fourth. Luis, in yet another week that demonstrates he has to be in the final, came a reasonable third with a cake described as elegant and pretty despite some unsightly folds in his marzipan dome. But once again Kate and Richard failed to rise to the bake. Richard, coming fifth, had a collapsed princess and failed on indistinct layers that were too thick, but, for the second week running, Kate takes first (second, and third) place in my playschool anti bake-off. Kate, oh poor Kate, an effort so unsightly I actually howled with nervous laughter. Her marzipan topping failed miserably and ended up being patched together resulting in something you’d find in the aforementioned playschool’s Play-Doh class (Paul scathingly calling it a marzipan ‘lid’) That topped with another terrible decorating attempt and Kate slumped home in sixth place. Nancy rightly won first place (was it me or was she extra northern and extra cutting this week?) with The Berrynator describing her effort as ‘so simple, so perfect..the classic Swedish princess cake.’ It was a sterling offering indeed. To the week’s denouement, a showstopper of true scale and endurance. The weary bunch were set a five-and-a half hour bake for a contemporary version of the Hungarian dobos torte. The dobos torte is traditionally a multi-layered sponge cake topped with caramel slices. The bakers had to present a version with at least two tiers, with an emphasis on sugar work and all things caramel. Luis devised a spectacular effort christened ‘the cage of the rocky hill’ based on a local landmark his wife loves. Filled with hazelnut, vanilla, salted caramel and salted buttercream he even finished ahead of time gaily anti-baccing his surfaces whilst the rest sweated around him. Mary declared it ‘a monumental effort. It’s spectacular. What I call a showstopper.’ But Paul thought its flavours quite ‘washy’ Mary agreeing, finding it ‘too sweet’. Still, we’ll be seeing you in the final Luis. Nancy fared well again with her chocolate and caramel dobos going down nicely with the judges. Mary describes its ‘beautifully cut edges, even layers of filling. It’s rich.’ Paul over-shared once again declaring ‘the nuts you’re getting through are lovely.’ That aside he thought it ‘very well made and very well executed.’ Chetna’s valiant effort was a fourteen sponge almond liqueur torte with chocolate caramel buttercream including caramel dipped grapes – which Mary declared ‘a clever idea.’ You have to hand it to Chetna, she has taken Kate’s cool customer crown and is steathily making her way to the semi finals at least. And what of Kate? Her offering was a trio of dobos torte flavoured individually with raspberry, chocolate and orange with some suspicious looking glazed nuts with a flowing tail that took me straight back to year 7 biology class. The result was almost as squirmsome. Mary declared her bottom sponge hadn’t softened and Paul thought her orange layer too dry. Kate’s partner in disaster this week Richard, attempted a sugar forest dobos. Two tiered with ten layers in each it was declared ‘a bit sad’ by Paul, referring to the dropped layers and misshapen tortes. By now it was clear Kate and Richard were treading on thin glaze as we moved in to the most genuinely tense showdown this series. Chetna stole the crown of star-baker but it fell to Sue to announce who was being shown the tent flap. With all four of our hosts looking visibly upset Sue revealed Berry & Hollywood had disagreed on which baker should get the elbow. Mary and Paul unsurprisingly revealed Kate and Richard were the contenders and in what felt like an excruciatingly long dissection of their bakes discussed the rises and falls of them both but we were treated to a sweet twist in the tale – neither were sent home. Admittedly it was a total cop-out, but honestly I was also very relieved. Neither baker really deserved to go home, both have demonstrated they are incredibly talented contestants – Richard especially. What it does demonstrate is things are going to get tense, tight and potentially very cut-throat as we head towards the final. Kate, purely for the horrific marzipa. I cannot un-see that horror. It’s Luis again. Not only Mr nice guy with his endearing wife-and-family stories he’s also the most consistent baker this series. Paul and his nuts were on show far too much this week. Last week I predicted Chetna, this week proving it’s too close to call. If you need me you’ll find me sitting on the fence.